I’m guilty of committing a bad scientific sin. I have a glorious cake sitting on my kitchen worktop and I have no way of knowing which of the variables I changed was responsible for its glory. Why? Because I changed all of the variables at the same time! Was it because I increased the amount of cornflour I added to the flour? Was it because I microwaved the cornflour as well as the flour? Or was it because I had a craving for lemon cake and added some lemon juice, which is acidic? I’m grateful to Adrian for his comments both here and on Rose’s blog – his observations and clear thinking prompted me to revisit the way in which I typically make up batches of ‘kate flour‘ and have resulted in a much easier and less messy method for its preparation. His questions have also lead me to try increasing the amount of starch so that the protein content of the flour/cornflour mix matches that of cake flour, as well as to introduce something acidic into the recipe to mimic an additional effect of chlorination on flour. I can certainly confirm that these changes have all proved successful. My lemon cake is beautifully light, fine-textured, moist and well-risen. My sink and dish-cloths are also less clogged up with flour spillages, which is something that will please my husband. Whether or not these changes were all necessary … I really can’t say! Grease, line and flour two 9″ x 1 1/2″ cake pans. Preheat the oven to 180 degrees C.
Place the flour and cornflour in a mixing bowl and whisk to combine. Put the mixture into a pyrex pie dish (not a bowl – the flour mix should be at an even depth of about 2cms). I’ve found that a pie dish is less messy than a plate when stirring the flour! Microwave the mixture at 750W for 4 to 5 minutes, stirring well at the end of each minute (I use a fork to fluff it all up and disturb any hot spots). Remove the pie dish carefully from the microwave using oven gloves. Sieve and discard any residue. Set aside to cool further. Combine the egg yolks, 2 oz of the milk, lemon juice and zest in a bowl. Set aside. Weigh out 10 1/2 oz of the flour mix – any remaining flour can be discarded or used to flour your cake pans. Sieve the flour mix into a large mixing bowl and add the sugar, baking powder and salt. Mix slowly to combine. Cut the butter up into small cubes and add to the dry ingredients. Add the remaining milk. Mix together slowly at first to moisten the dry ingredients, then beat for 1 1/2 minutes at medium speed (I go to no. 4 on my Kenwood). Beat in the lemony-egg mixture in 3 batches, scraping down the sides of the bowl after each batch to make sure that all ingredients are combined. Divide the batter between the two prepared cake pans and smooth with a spatula. Bake in the centre of the oven for 25 to 35 mins until the top is springy but the sides have not yet started to shrink. Cool on wire racks for 10 mins before removing the cakes from the pans. What about the cauliflower? Well, we went to Dart’s Farm this morning and there in the entrance was a table stacked high with the most wonderful cauliflowers I have ever seen. And they were all grown locally in Budleigh. I don’t even really like eating cauliflower, but I couldn’t resist buying one of these beauties! Your cake looks good , Kate, I hope it tastes as good as it looks!! I’m sure it does! I was beginning to think you’d gone into retirement, only joking, I know how busy you’ve been lately and I have been reading your posts on Rose’s blog. Glad to see you are still testing out the flours, it is a bit of a faff though isn’t it? Is the recipe for the cake on here, I couldn’t see it? Dart’s farm does have some good stuff, but they are a bit pricey , in my opinion, but then I think most things are pricier in the south than up here in the north. Nice to see you are still posting, Cheers, Jeannette. It’s not quite such a faff now if you do the cornflour bit all in one go before microwaving – do give it a go! There’s a paper I found by some scientists in Japan that includes photos of starch molecules from maize after they have been nuked in the microwave. They really are very pitted and ruptured. If it is this effect that is also responsible for the improvements we see in the performance of our flour after microwaving, it makes sense to blast as much starch as possible! The cake looks terrific! You are getting better and better. Is Dart’s farm where we are meeting for lunch in April sometime? So if you don’t really like cauliflower what did you make with it and who did you make it for? 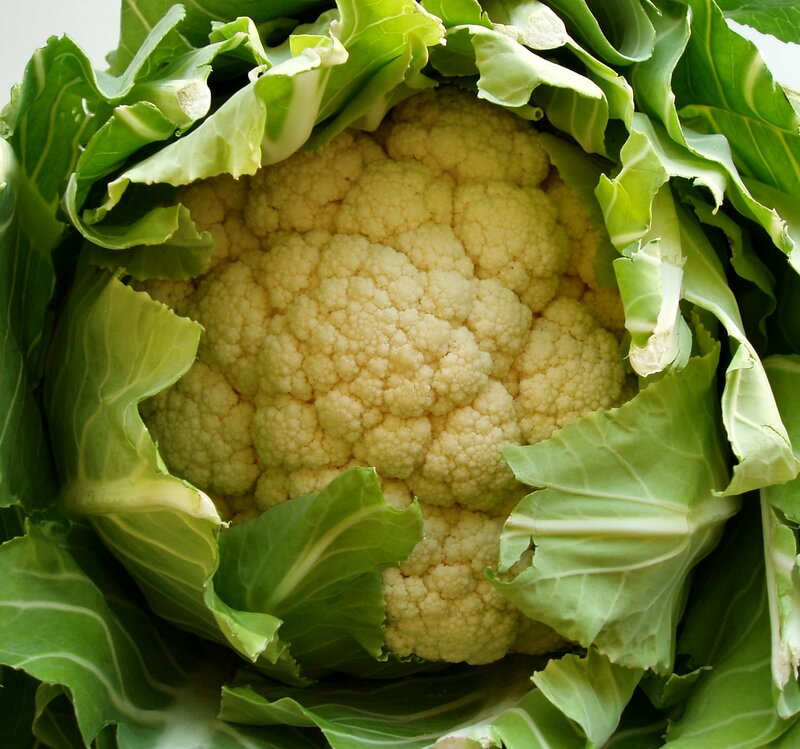 Cauliflower soup is wonderful and it doesn’t taste too cauliflowery… done smooth and creamy. We made cauliflower-cheese which, with enough cheese sauce, is just about the only passable way to eat cauliflower 😉 I’ll have to try cauliflower soup sometime – it sounds like it could broaden (double!) my cauliflower repertoire! Just popped into your blog to see what wonders you are creating. That Lemon Cake looks awesome. I’ll need to look at Rose’s blog to see the threads about Kate Flour. Are you still stikcing to the old way of making it or is there a new way? 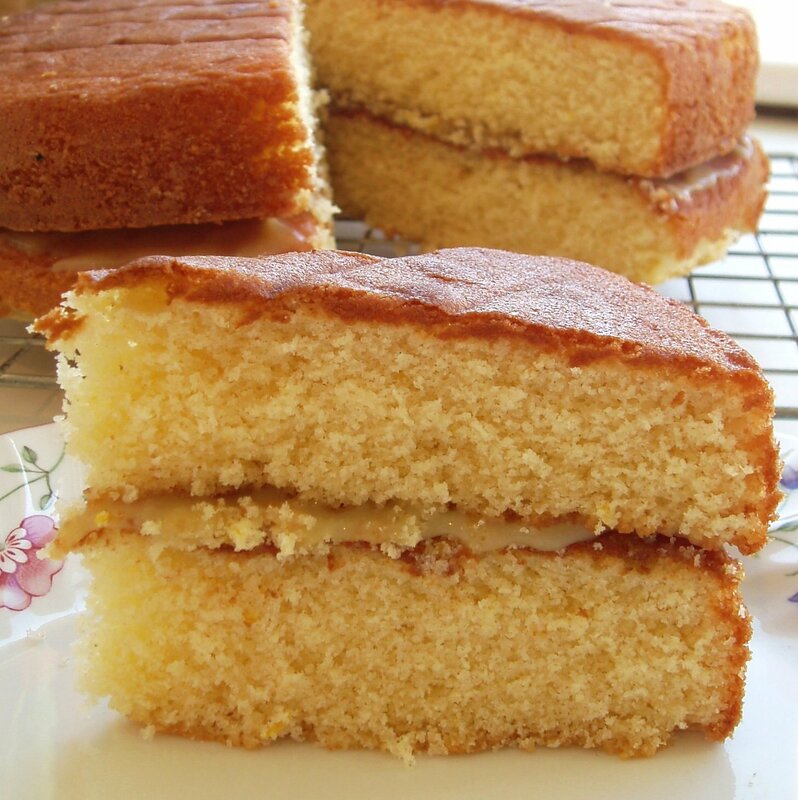 What did you fill your yummy Lemon Cake with – is it lemon curd? Not been baking much as the waistband has been a bit constrictive since the festive but I baked your Carrot Cake a few times as it is a kind of a healthy cake!?! Hi Janice – I’m pleased you’re enjoying the carrot cake (although I won’t comment on how healthy (or not!) it is!). Whenever I need kate flour these days, I’m making it up as I described in the lemon cake recipe – ie. I substitute 20% of the flour’s weight with an equal weight of cornflour and mix these together before microwaving. It seems to be considerably less messy this way and also easier to make up with fewer steps involved. Thanks for that. Can I just confirm that I have it right, if Rose’s recipe says to use 10.5 oz of cake flour I add 9.5 oz of Plain 00 Flour and 2.5 oz cornflour, and microwave them together, then weigh from that 10.5 oz? Sorry to be such a numpty but just want to make sure I am doing it right. I’ve just got round to looking at Rose’s blog, the bit where you discuss flour. It’s a bit technical for me, but I am delighted that all your fab work is getting recognition. You deserve it. I think the sequel to the “The Cake Bible ” should be “The New Testament” by Kate and Rose!!!! Although I get a bit lost reading all the technical stuff – it makes fascinating reading. Can’t wait to bake that Lemon Butter Cake – might give it a go this weekend. Well, I had a go at your Lemon Butter Cake yesterday. It rose like a dream, has a lovely lemony taste and fluffy texture, however it seemed a bit dry to me, and a bit fragile particularly at the edges. I’m not sure what I did wrong. The only two factors I could think that were different were that 1) my butter was not quite as soft as when I had baked the All Occassion Downy Yellow Butter Cake (AODYBC) and 2) I used some left over Kate Flour which I had stored to make up about one and a bit ounces of the flour. This method of making the flour is certainly a lot easier and a lot less messy. However I didn’t have quite enough when I made it up following the measurements, as I lose quite a bit on the bottom and sides of the pie dish when I “nuke” it in the micro-wave. Luckily I had some “Kate Flour” which I had made when I last baked the AODYBC I had stored the “Kate Flour” in an airtight Lock n Lock container so thought it would have been Ok, but perhaps this was what caused the dryness. I have the Kate Flour labelled as such in your honour in my cupboard. Is my maths right Kate, if I make Kate flour again but make a bit more – say 11 and half ounces 00 flour and 3 ounces of cornflour?. Rose’s bible seems to label dryness as due to overcooking but I only cooked it for 27 minutes which was about the same as last time; the cake was not yet shrinking from the edges of the tin when I removed it. So I don’t think it was that. Anyway, I filled it with home-made lemon curd. We ate it with cream poured over it – so all is not lost. And this cake was still 100% better than my pre Bible attempts at cake baking. It looked quite tall but the sides were fragile and crumbly. The taste was divine and so definitely worth another go at it. Did you ever find that one of your cakes went slightly dry and a bit fragile at the edges? I’m not too sure about dryness – did you microwave the flour for too long perhaps, or was your oven too hot … or was 27 mins was just too long? I have to say though that my lemon cake, while not dry, had a tighter grain than the yellow cake I made a week later. I remember Rose mentioning this to me as a characteristic she’d found of adding acids – so perhaps that’s what you experienced as dryness? Hi Kate – no probs, I think I’ve come to the conclusion that 27mins must have been just a bit too long. The taste was lovely mind you. I’ve just read your further work on flour – amazing stuff. I really admire your perseverence on this. Keep up the good work.